Revealing mistake: In several of the sanatorium scenes, you can see large pieces of cardboard attached to the lamps to affect the lighting. Revealing mistake: When Renfield walks up to the front door of the castle, he is in a court yard where the only light comes from torches. But the light is enough to make him throw a clear shadow on the wall, and the shadow never flickers as it would in torch light. 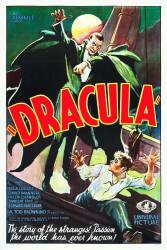 Audio problem: In the uncensored version (certain scenes were thought too graphic, and thus a lot of copies of the movie are edited), Dracula picks Renfield up and strangles him, and Renfield is screaming. Okay, how can someone scream if they're being strangled? (The censored version, however, works because you can't hear Renfield). Factual error: Dracula refers to the town of Whitby as "so close to London" when in fact it is 243 miles away. Other mistake: During the opening credits, it reads "Carl Laemmle Presient" dropping the "d" from "president." To accommodate all sorts of viewers, the studio also made a silent version of the film (for cinemas without sound equipment) and a Spanish-speaking version (to be shown in Latin America). The Spanish version is considered a better film, because it was filmed after the English takes each day, so the Spanish director and actors would watch the English takes and decide how to improve on them.